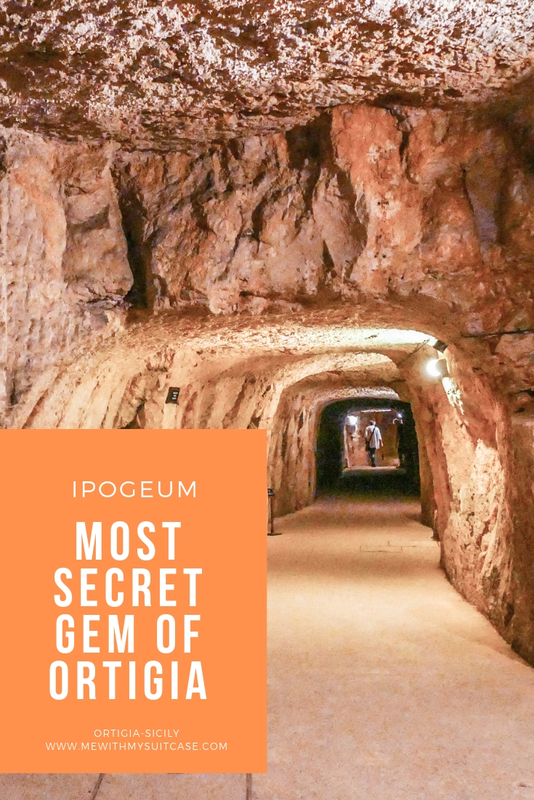 Hypogeum in Syracuse is an ancient cistern system realized by the Greek but turned into a refuge from the Allied bombing unleashed upon the city of Syracuse during the Second World War. 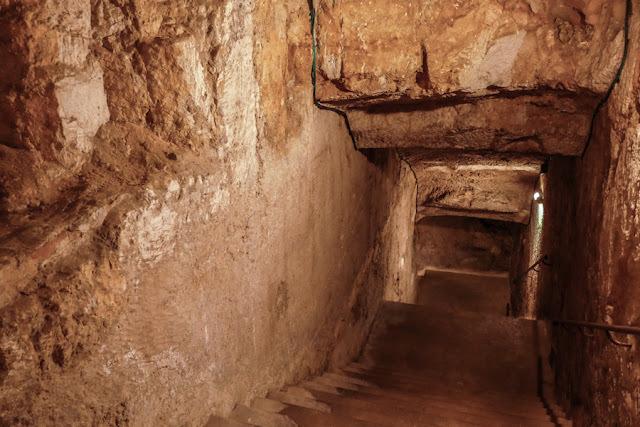 Hypogeum in Syracuse is an estensive underground tunnel network which has been discovered in 1869. Hypogeum in Syracuse is a stricking passage in the bowels of the town with its entrance in the Piazza Duomo and exit in the Foro Italico Harbour. 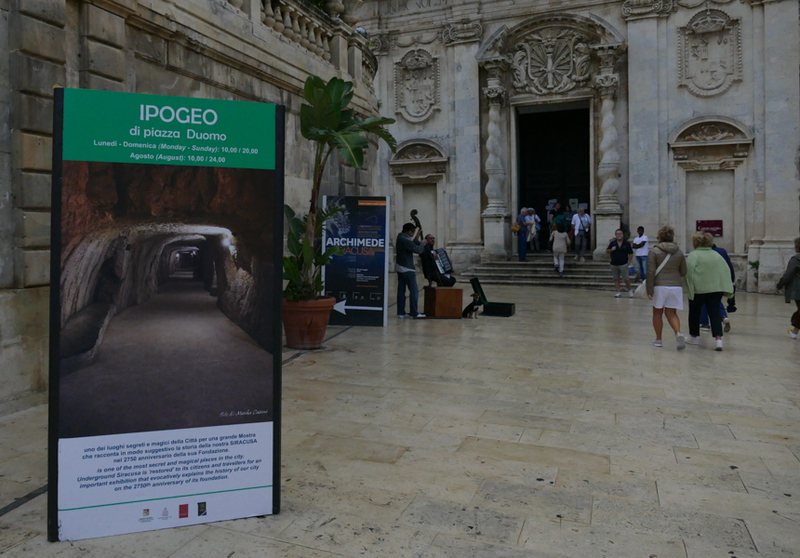 Hypogeum in Syracuse is open to visitors from 10 am to 8 pm from September to July and from 10 am to midnight in August. Many visitors find it impressive, I don't know if so it is but certainly it is one of the interesting things to do in Syracuse for both adults and children specially when done with guides. We haven’t planned a visit the Hypogeum (Ipogeo) in Ortigia Island, (Syracuse) because we have never heard about it before our arrivals. We just saw it casually when we were in the Piazza Duomo. Panels exposed outside were mentioning about a guided tour both in English and Italian language included in the price and that sounded really interesting since the ticket was costing only five euros. We entered and bought the tickets! Knowing already that the tour was with the guide we asked the girl at the reception about the guide meeting point. She said that the guide has already finished the rounds. We insisted because the board sign outside was confirming the tour until 5 pm and it was not even 4 pm! Suddenly while trying to understand this disappointment with the cassier, a woman came up from the stairs and said to the cashier that she could be available for one more tour in one hour of time. Here came our second disappointment. We felt like it was depending on her own mood. 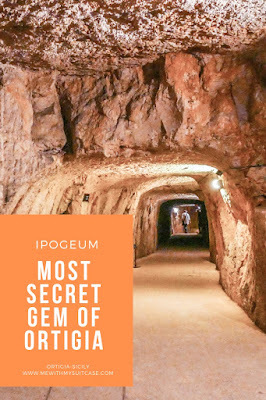 The photos outside gave high hopes of Hypogeum and we couldn’t believe that it could be so badly organized and overall it was based on the decision of the staff. After clarifying this situation we went for a quick walk and came back to Hypogeum an hour later. The tour started from the square, at the foot of the garden of the Archbishop's palace and ended by an exit close to the seashore (FORO ITALICO EXIT). 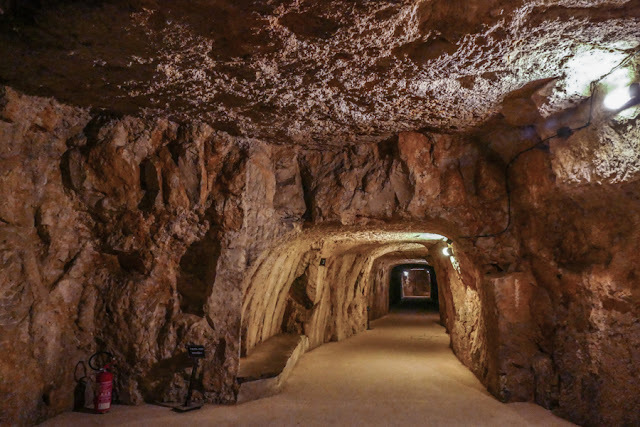 Believe me, the caves and the history behind these tunnel networks were really very interesting. It was an ancient cistern system network realized by the Greek but turned into a refuge from the Allied bombing unleashed upon the city of Syracuse during the Second World War. In the summer it is certainly a welcome oasis of cool air but it could be very cold in the winter. 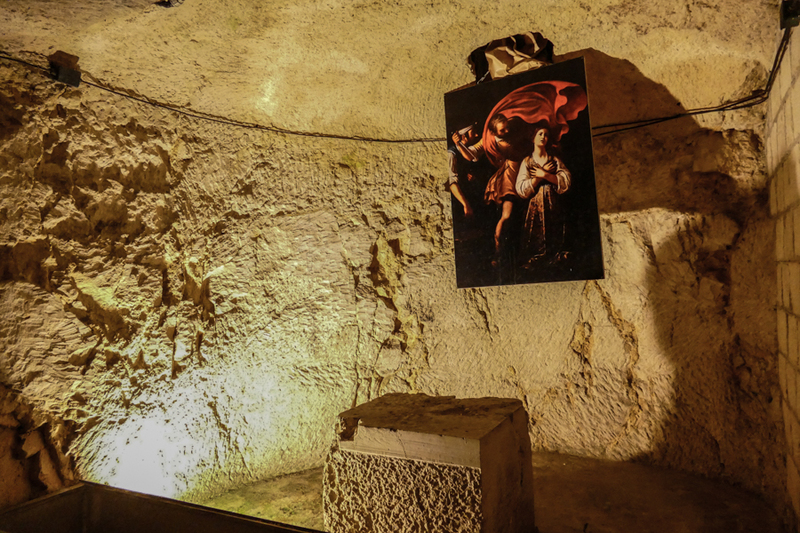 Sadly I also have to underline that it was not a wheelchair friendly visit since the descent from the Piazza Duomo was possible only by the staircase. Let me tell you one more thing, the guide insisted so much at the exit by the seashore to buy the boat trip around Ortigia Island. It was evident that she was having commissions on sales. Take your time to decide, don't let them get to you because the boat trips around Ortigia Island cost more or less the same everywhere. In my personal opinion, it would have been useless visiting it without a guide because there was a very few little information available on boards as you go round the tunnels and they even don’t have audio guides. So, we considered ourselves lucky that she could lead us along the way because otherwise, it would have been a wasted opportunity to learn something exceptional. Nevertheless, the presentation of history by the staff is to be improved! This seems like my kind of adventure! Awesome post! 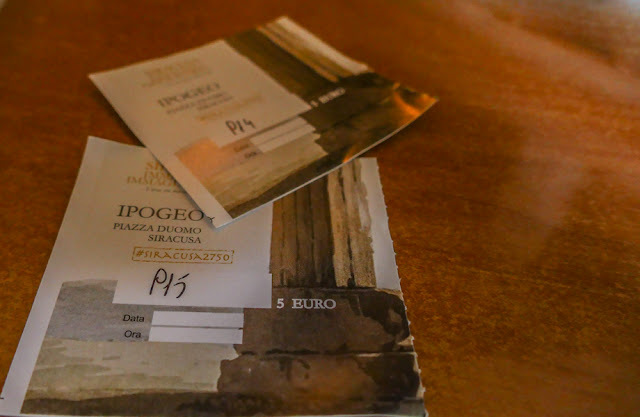 It sounds like you were lucky to get a guide to take you through. 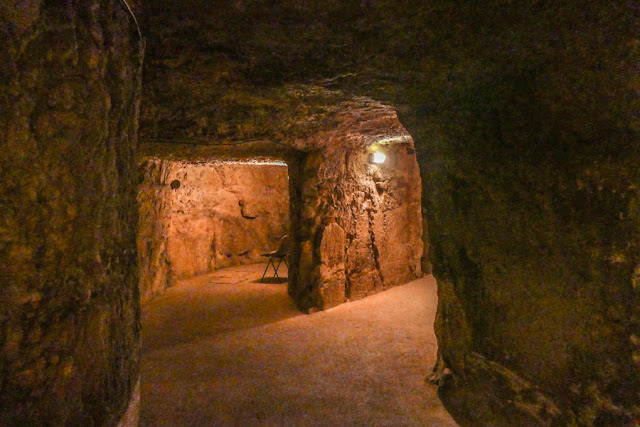 I love finding some surprising places to go, and underground places always seem so secret and special. I am Italian but I have never been here. 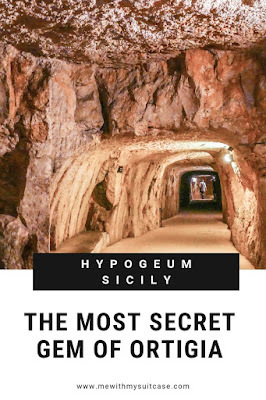 This is good to know, maybe one day will discover this part of Sicily. I feel kinda scared of underground place. Don't know why it makes me feel claustrophobic but I love reading about them! Italy is so beautiful everything looks interesting.